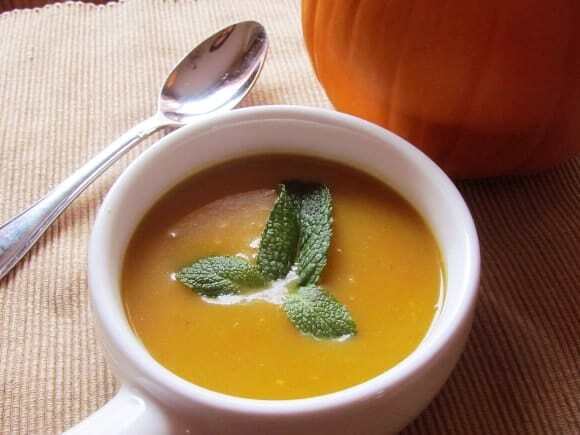 This Roasted Pumpkin Soup easy soup recipe contains affiliate links. Now if you read my latest post about pumpkin carving, you will know by now that I NEVER carved a pumpkin before! Well I never carved a pumpkin and never cooked a pumpkin soup! I should have done that years before because it is such an easy soup recipe! Most of all my son (who is in his teen years and whining about vegetables I cook) ate it and asked for more! Easy, healthy and loved by everyone: what more could a mom ask for? So let’s get started! 2 teaspoons of chopped garlic. It is better to use fresh garlic and chop it but I am too lazy for that and don’t like the smell of garlic on my hands after. I buy the ready-to-use garlic! 4 potatoes peeled and cut into cubes! The original recipe suggested cutting the pumpkin into small chunks and then cooking it in the oven. I did the other way round: I washed the pumkin, cut in half and cooked for 30 minutes on oven tray! I find it easier to scoop the pumkin when it is cooked ! Pumkins can be hard to cut. As I am always looking for easy recipes and most importantly: fast ways to cook, I prefer my way. But both ways work! Once cooked, scoop out the flesh! I did not even bother to mash! Add the pumpkin, potato and stock and bring to boil! Then put it in your blender! Some people add cream to it but I do not like that. I added some 2% milk and some shredded cheese! Perefection. Serve it with some spinach meat balls and garlic bread and you have an easy healthy meal that everybody will love. This Easy Soup Recipe was featured at Bubbly Nature Creations! Thank you for the feature! I’ve never tried pumpkin soup before, but this recipe sounds easy to make & looks super yummy, thanks! This sounds great for these cold fall days we are having! Thanks so much for sharing at Share Your Stuff Tuesdays!! Your recipe is featured on Full Plate Thursday this week. Hope you have a great weekend and enjoy your new Red Plate. What a beautifully simple pumpkin soup. Thanks for sharing at Simple Supper Tuesday. I see you’ve linked up this great looking recipe at the Food Friends link party. I’d love for you to come share it on my new link party – Required Ingredient Recipe Link Party – that just went live. Every Sunday I feature a different ingredient and this week it is pumpkin. I see you’ve linked up this great looking recipe at the Flamingo Toes link party. I’d love for you to come share it on my new link party – Required Ingredient Recipe Link Party – that just went live. Every Sunday I feature a different ingredient and this week it is pumpkin. I love how simple and seasonally delcious your soup looks. Thanks for sharing it with us on foodie friday. 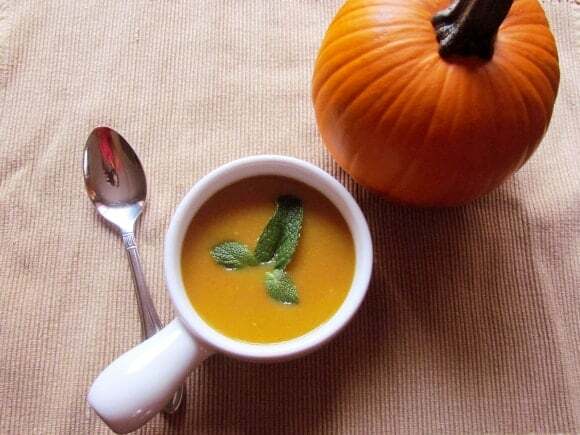 I just love Pumpkin Soup and your recipe looks delicious! Thank you so much for taking the time during this busy season to share your wonderful post with Full Plate Thursday. Have a wonderful weekend and hope to see you again real soon! Thank you for stopping by! Isn’t it a great recipe! I’ve had this soup on my mind this week. Thanks for sharing this recipe. ‘Tis the season for something like this. Having a warm cup or bowl of soup is so comforting. I’ve never tried pumpkin soup so I may just try this recipe. Thank you for sharing it on the Thumping Thursdays Blog Hop. Pumpkin Soup…….sounds so good. I bet I could get my little guy to eat this. I am curious how much pumpkin you actually used. Large or small? I wonder if I could use pumpkin puree in a pinch? I love all things pumpkin, but have never tried to make pumpkin soupl. I’m excited to give it a try. I don’t know about pumpkin puree. It would be easier! I used a medium sized pumpkin! I am sure your little man will love it. My boy asked for more and he does not like soups! What size pumpkin for this recipe? I use a medium size one! I have never baked a pumpkin pie! My family is not a fan of pie although I love them. I have never tried pumpkin soup. I think pumpkin and I think dessert so am just trying to imagine this. Thanks for sharing. Which Face Products Are Safe During Pregnancy?